Greece is buckling under the strain of the capital controls and is at risk of undoing four decades of integration with Europe. 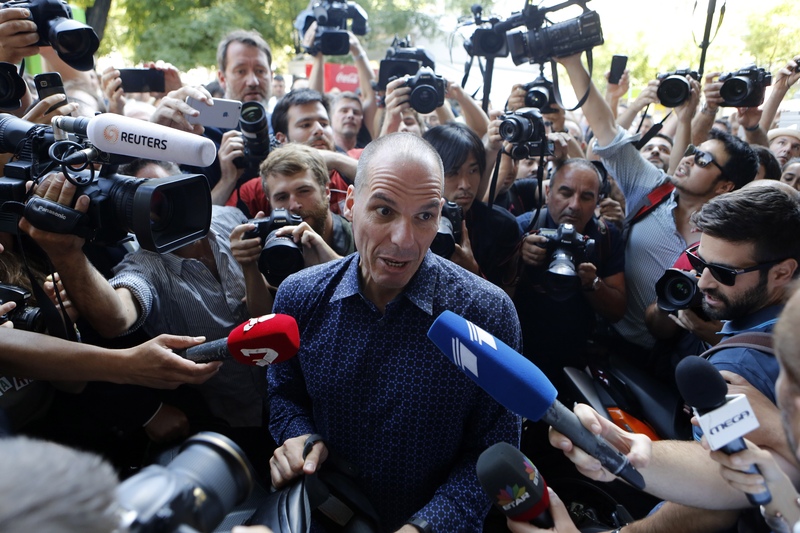 Greek Finance Minister Yanis Varoufakis said he was stepping down after more than five months of confrontation. (Bloomberg) — Greece’s creditors turned up the heat on Prime Minister Alexis Tsipras to come up with a plan to stay in the euro, as banknotes become more scarce and the nation stares at an economic calamity. After voters emphatically endorsed Tsipras’s call for a “no” to more austerity in Sunday’s referendum, European finance ministers are waiting for a proposal to re-start bailout talks. In a bid to speed the process, Greek Finance Minister Yanis Varoufakis said he was stepping down after more than five months of confrontation. The onus is on Greece to act quickly to avoid a meltdown of its banking industry. A week of capital controls is set to be extended, while the cash machines that have money are running short of notes and pensions are rationed. German Chancellor Angela Merkel and French President Francois Hollande are due to meet other euro-region leaders tomorrow as the crisis escalates while the European Central Bank is also evaluating its next moves to keep the country afloat. Financial markets were more sanguine about Greece’s fate. The euro was down 0.8 percent to $1.1029 at 2:25 p.m. in London. The Stoxx Europe 600 Index fell 1.3 percent, compared with a drop of as much as 3.2 percent a week ago when Tsipras introduced capital controls and closed banks. The problem for Tsipras is that the muted response from investors was matched by European leaders showing no immediate willingness to compromise. Merkel’s chief spokesman, Steffen Seibert, said no resolution was imminent. A deal within 48 hours will be “difficult to achieve,” he said. Varoufakis said his departure was intended to bolster Greece’s position after a larger-than-forecast 61 percent of voters rejected further austerity. The motorbike-riding economics professor had sparred openly with counterparts including Wolfgang Schaeuble of Germany. He is being replaced by Deputy Foreign Minister Euclid Tsakalotos, Skai television reported. Tsipras has involved Tsakalotos, a trusted party hand, in negotiations recently as Varoufakis took more of a back seat. The referendum asked Greeks whether they would accept the terms set by creditors in exchange for new financial aid, including curbs on early retirement and sales-tax increases. Greece desperately needs to secure a new deal to save its economy from collapse. Banks may run out of cash within days if not hours unless the ECB extends an emergency lifeline. The Coalition of the Radical Left, or Syriza, led by Tsipras swept to power in January after campaigning to end crippling budget cuts forced upon the country by creditors and promising to restore “dignity.” Optimism for a deal toward the end of last month was suddenly halted when he called the referendum on June 27, putting an end to talks. European leaders had largely characterized the plebiscite as a vote on membership in the euro itself, although Tsipras insists Greece can stay in regardless. The country is buckling under the strain of the capital controls and is at risk of undoing four decades of integration with Europe. The economy has already shrunk about 25 percent over the past six years while the jobless rate is still the highest in the euro region. –With assistance from Vassilis Karamanis, Jenny Paris, Ilya Gridneff, Nikos Chrysoloras and Marcus Bensasson in Athens, Emma O’Brien in Wellington, Helene Fouquet in Paris, David Tweed in Hong Kong, Constantine Courcoulas in Istanbul and Corina Ruhe in Amsterdam.